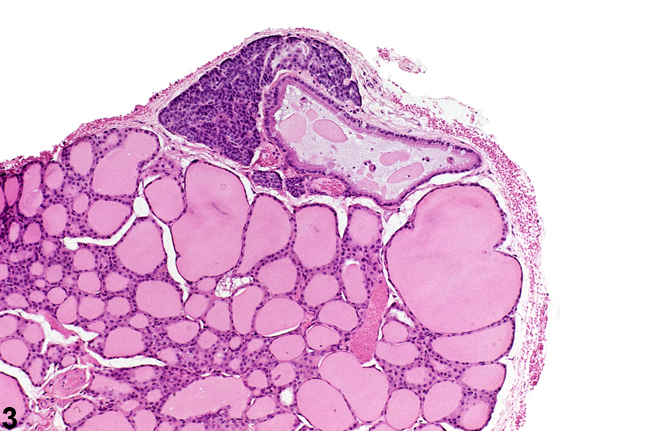 Parathyroid Gland - Cyst, Congenital in a male B6C3F1 mouse from a chronic study. Two cysts are present in the parathyroid. 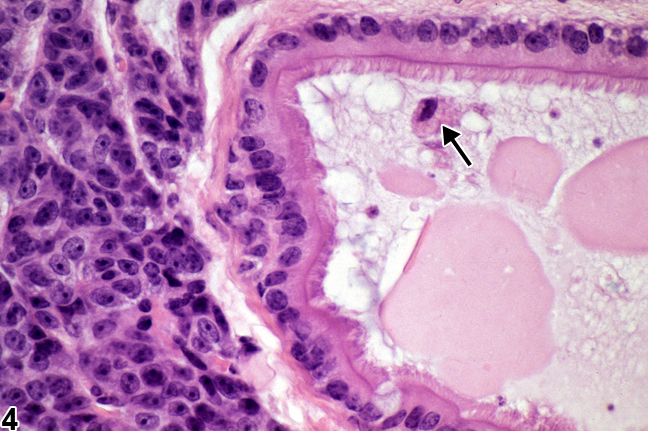 One cyst contains vacuolated proteinaceous material (arrow), and the second cyst contains proteinaceous material, cellular debris, and eosinophilic crystals. 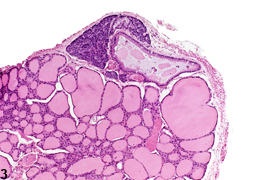 Parathyroid Gland - Cyst, Congenital in a male B6C3F1 mouse from a chronic study. This higher magnification of Figure 1 shows a cyst lined by ciliated tall cuboidal cells and the presence of vacuolated proteinaceous material filling the cyst lumen. Parathyroid Gland - Cyst, Congenital in a male B6C3F1 mouse from a chronic study. An elongated cyst containing proteinaceous material is present within and extending from the parathyroid. Parathyroid Gland - Cyst, Congenital in a male B6C3F1 mouse from a chronic study. Higher magnification of Figure 3 showing ciliated columnar cells lining the cyst and flocculant, eosinophilic, proteinaceous material and a degenerating sloughed cell with a nuclear fragment (arrow) in the lumen. Distinguishing between a thyroglossal and an ultimobranchial origin for parathyroid cysts is somewhat equivocal since either may have a ciliated cell lining. Consequently, "congenital cyst" is the preferred terminology. 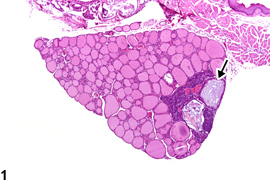 These can be seen within or adjacent to the parathyroid gland in rats and mice. 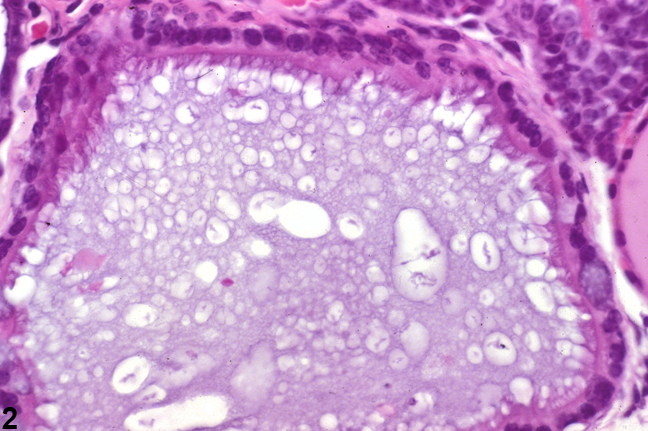 Congenital cysts are typically lined by cuboidal to columnar epithelium that may be ciliated. Cyst lumens may contain heterogeneous proteinaceous material and cellular debris. For studies that include in utero exposure, developmental alterations potentially related to treatment could influence the ultimate presence and appearance of parathyroid cysts. Both thyroglossal and ultimobranchial cysts should be diagnosed as "parathyroid gland - cyst, congenital". A severity grade is not necessary. If both parathyroids are involved, the diagnosis should be qualified as bilateral. Hardisty JF, Boorman GA. 1990. Thyroid gland. In: Pathology of the Fischer Rat: Reference and Atlas (Boorman GA, Eustis SL, Elwell MR, Montgomery CA, MacKenzie WF, eds). Academic Press, San Diego, 519-536. Hardisty JF, Boorman GA. 1999. Thyroid and parathyroid glands. In: Pathology of the Mouse: Reference and Atlas (Maronpot RR, Boorman GA, Gaul BW, eds). Cache River Press, Vienna, IL, 537-554. Seely JC, Hildebrandt PK.. 1990. Parathyroid gland. In: Pathology of the Fischer Rat: Reference and Atlas (Boorman GA, Eustis SL, Elwell MR, Montgomery CA, MacKenzie WF, eds). Academic Press, San Diego, 537-543.